As my first week of school was coming to an end, Raquel had decided to top it off by giving me a tour of The Alcazar of Seville. And, it was amazing! Did I mention yet that Raquel is the best tour guide ever? 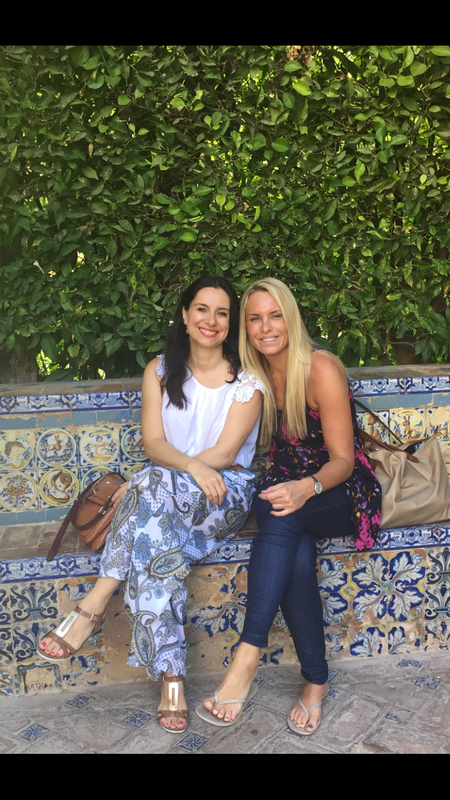 Not only has she lived in Sevilla her entire life, and a fountain of information, but she’s also very fun and makes already fantastic activities even more fantastic! The Alcazar of Seville is a royal palace located right next to the Cathedral. It was originally developed by Moorish Muslim kings and is regarded as one of the most outstanding examples of Mideast architecture found on the Iberian Peninsula. The upper levels of the Alcazar are still used by the royal family as the official Seville residence and it is the oldest royal palace still in use in Europe. After my personal tour, we went to lunch and Raquel taught me all about the food and the menu. After lunch we strolled by the Cathedral and stopped at a Heladeria and got helado. As we continued our walk down the street, the masked man under the table jumped at us while chirping his notorious noises! This mask gets me every time and we laughed so hard I nearly dropped my ice cream. We than went back to ESIC to have class. I learned so much already this week about geography, history, gastronomy and culture. This week has been just amazing and I feel truly blessed! Gloria made Chorizo for dinner and Pablo and I ate and spoke about my upcoming weekend trip to Ronda.